This card was made with the stamp set; Love You Much. I really like how this card turned out. Oh, this is a full card. 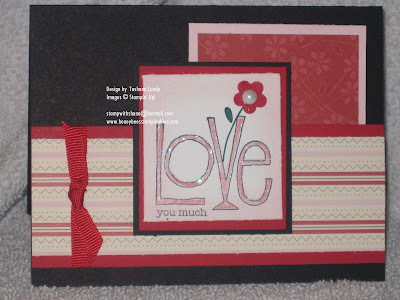 I used Basic Black, Real Red, Whisper White and Pink Pirouette card stock. I used the new Candy Lane DSP, Real Red Grosgrain ribbon, DD Glitter, 2 Way Glue Pen, Trio Flower punch, Pretties Kit pearl, Blender Pen with Riding Hood Red Ink, and Garden Green marker. I have one more swap to share tomorrow. I really love that one. I can't wait until you get to see. Don't be afraid to leave comments. I don't mind:-) Next week I will share what I got in return for my swaps. This is fun. I will see you on Monday.